Two years ago the C E Roberts house (designed by Daniel Burnham then remodeled by FLW in 1896) was part of Oak Park's Wright Walk tours. I went thru it, and it didn't make much of an impression. I'm only just now connecting the dots ... where I'd seen that name before. 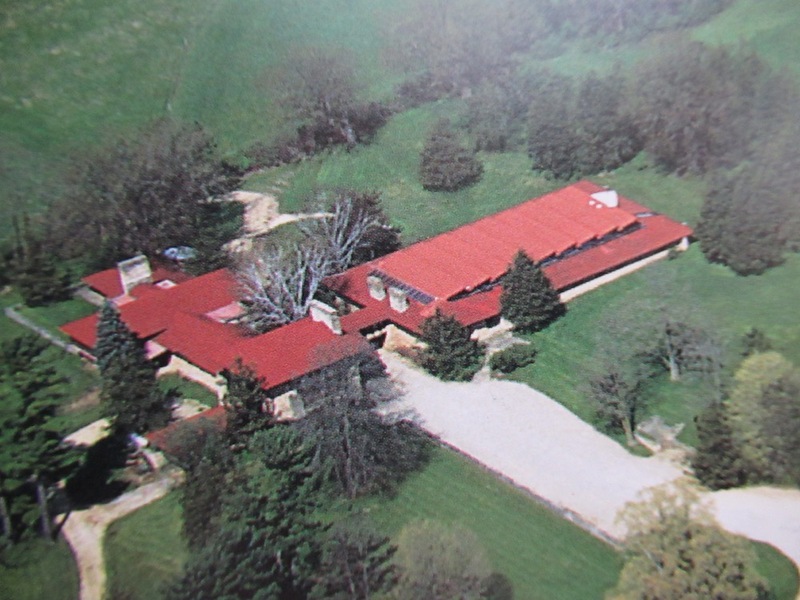 When I had toured Hillside at Taliesin it had exceeded my expectations. I'd feared I might be disappointed by finding the place tattered and rough, but to the contrary, its patina and raw character was very powerful, with an aura & wear of creative adventure. Most powerful, of course, was the drafting studio. Where the really, really good stuff happened. On the way into that great room, one crossed a bridge from the original school building, passing the Call Building model en route. Before entering the great studio there is a little stretch of compression where the hallway passes by a pair of flanking room, each curiously accessed by descending a few stairs that are screened by a half height wall. Entrances hardly noticeable but for a bright patch of red color. 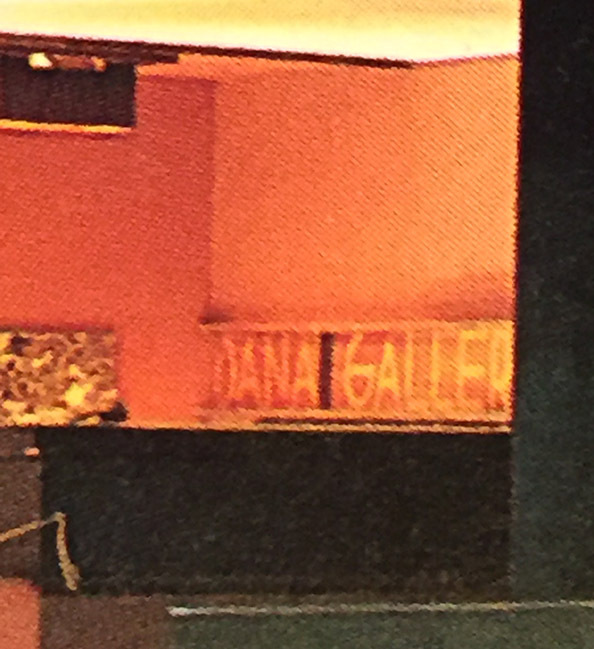 And the signage -- each is adorned with Wrightian font: "Dana Gallery" and "Charles E Roberts Room". It struck me as an unusual thing: Frank Lloyd Wright putting someone else's name on a room in his building. But if he was to thus dedicate a part of his sanctum, Susan Lawrence Dana's name figured plausible -- the Dana house being one of his major accomplishments. 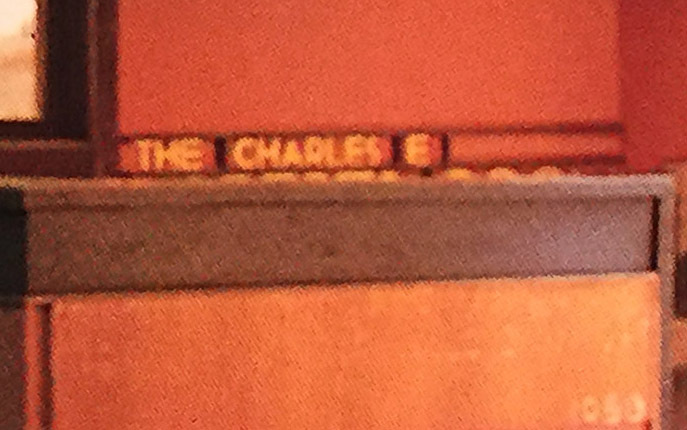 But, Charles E Roberts? 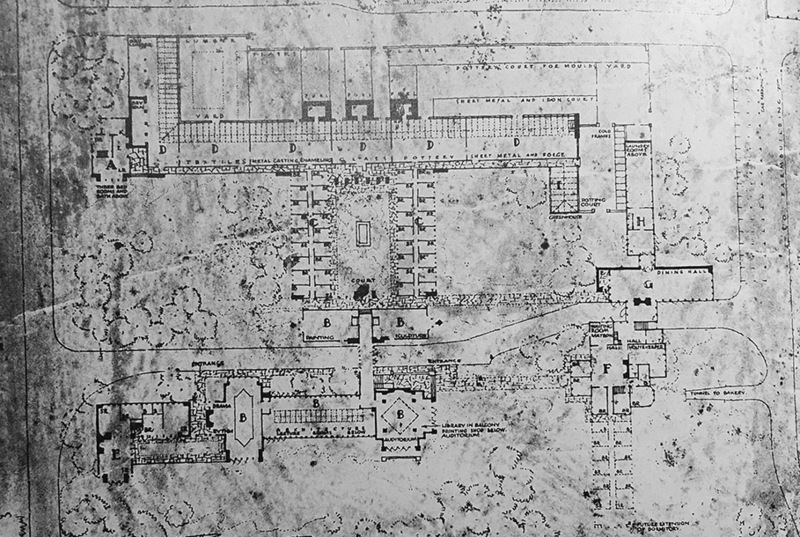 We see the connecting bridge from the original Hillside school pass thru flanking rooms, on axis with a courtyard surrounded by apprentice quarters. 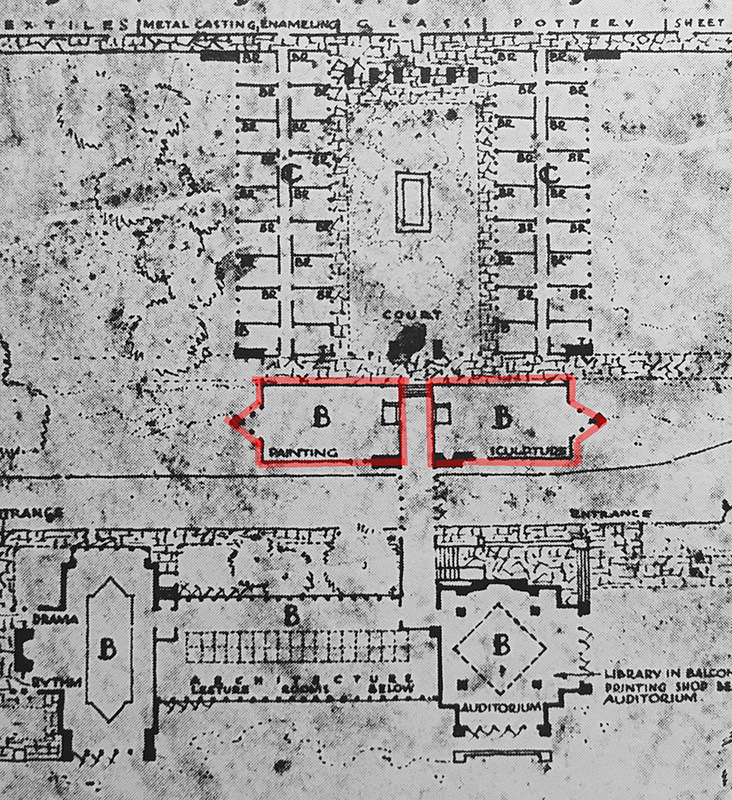 Although the overall ambitious scheme is radically different, we find the same pair of rooms flanking the central passageway which leads this time, not to an empty courtyard, but to the holy of holies. 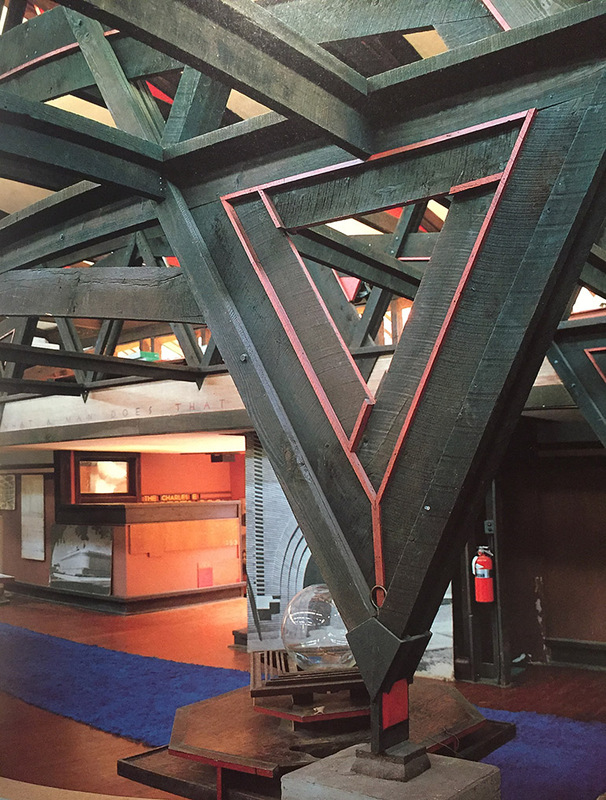 It's my understanding that Roberts was largely responsible for Wright's commission for Unity Temple. Wright understandably owed him a debt of gratitude for that big break. 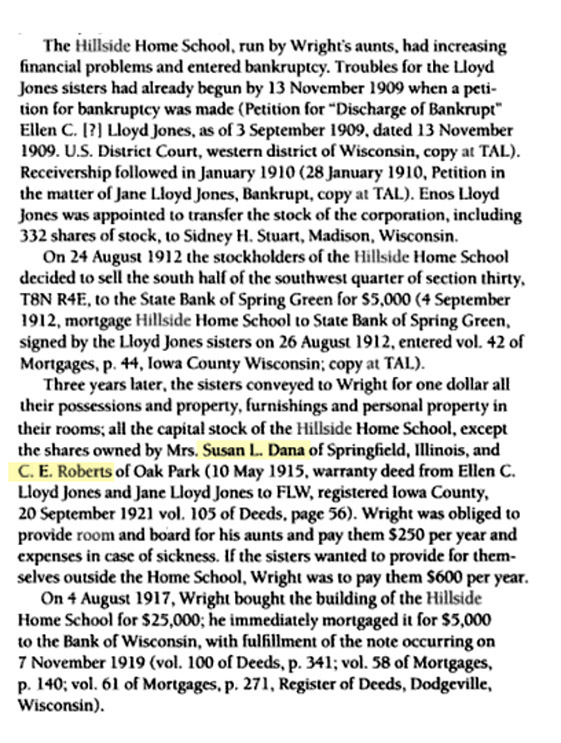 A Google search lead to a footnote in Anthony Alofsin's Frank Lloyd Wright -- The Lost Years 1910-1922, which referred to both Dana & Roberts as stockholders in the original Hillside Home School back in the teens. Their connection back then manifested itself decades later, memorialized in these galleries. far as I can tell; I found one photo in my collection that includes this building and have taken a detail of that photo, here. indicated on the plans) that are posted above. Or is it ? The parallel lines on the second plan---whose view drawing omits the skylight---might refer, if obliquely, to the skylight . . . ? 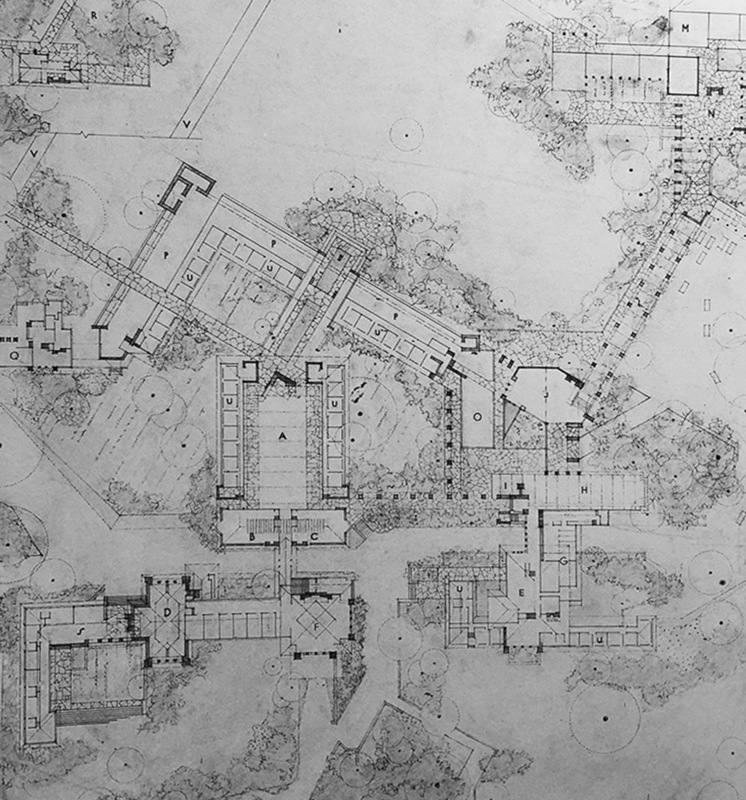 In his later years, John Geiger drew many plans, sections and elevations of Hillside. It became an obsession of his. More anticipation for his archive to open to the public. Hillside is a masterpiece, on a par with the best of FLW's work. The course quality of its construction is one of its main assets. The House, Barn, Windmill and Dams also share that same quality, even while his work for clients was as sophisticated and polished as need be. 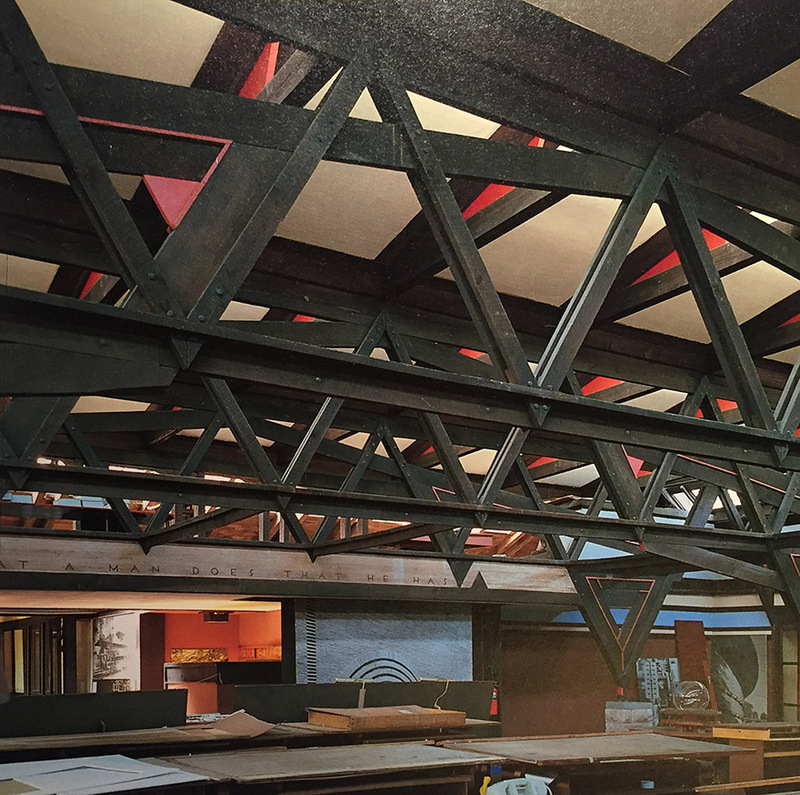 There is, in FLW's work, a connection to the humble, Gerry-built Midwestern farmhouse. Not the pretensions of the 'design' of it, but the way the interior ceiling planes of the upper story intersect, seemingly at random, creating spacial liveliness the builder was undoubtedly unaware of. I believe he was affected deeply by those accidental spaces, as likely imaginary as real, and that he incorporated them in his work throughout his career. 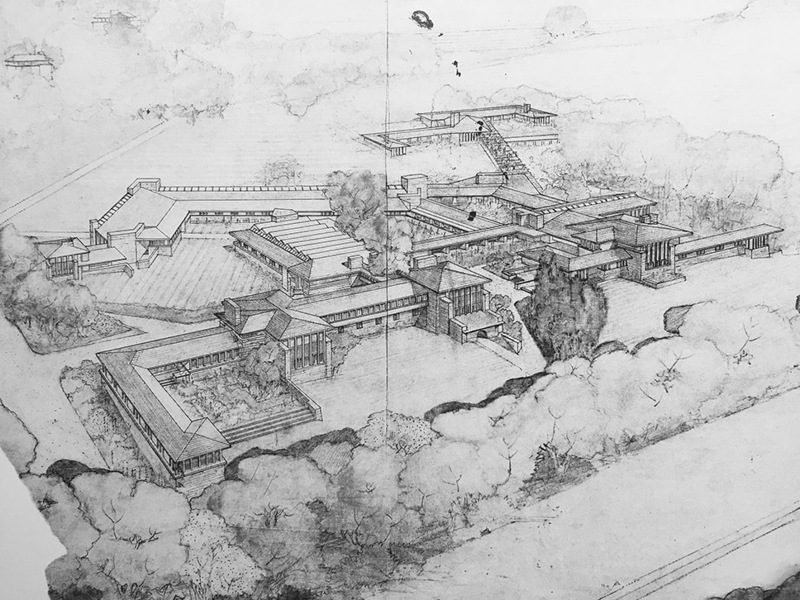 The buildings of Taliesin exemplify that connection more blatantly than most of his other work, and it all, as a single effort, should be the major focus of study. It didn't hurt that C.E. 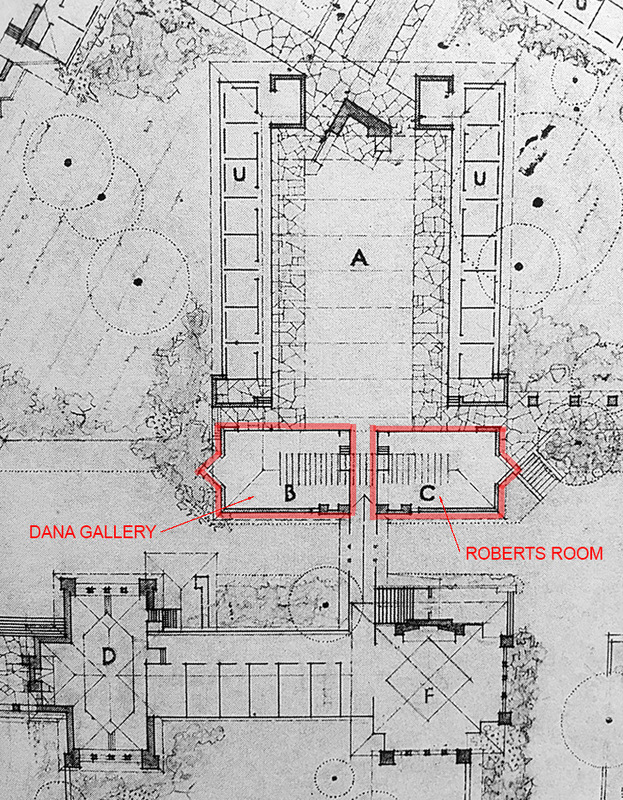 Roberts was on the Unity Temple building committee, but Wright was not a complete shoo-in for the job either. Along with a history of the congregation, the design and construction story can be found in "The Nobel Room" by David M. Sokol, who put 20 years into researching the chaotic creation of the masterpiece. Charles's Roberts daughter, Isabele, was Wright's office manager (and client). Never could place that Futagawa shot before now. and the way it reflects light in that shot is powerful. ...the model of the pavilion is way cool too. Isabel Roberts was Wright's office manager but she was not related to Charles Roberts. She was born in 1874 in Mexico, Missouri to James H. and Mary Roberts. She spent much of her youth in South Bend, Indiana where her father was a machinist. ...and Isabel Roberts was friends with Laura Bowsher in South Bend, who later married Kersey DeRhodes. The DeRhodes' built a Wright house in South Bend that has lately been attributed to Isabel Roberts as a derivation of the Walser/Barton/Horner plan type. Of course, if there were a shred of evidence that Isabel Roberts had anything more to do with DeRhodes than possibly steering them toward FLW, the house would never have made the cut for the Wasmuth Portfolio. Isabel was a designer of modest talent, as she proved once she left FLW and went into a practice of her own. Did she study architecture, or pick it up as an interest while in Wright's employ ? Thanks to Randolph Henning for his transcriptions of the "At Taliesin" articles that allowed me to find this so quickly. And thank you, pmahoney, for pointing out that Isabel Roberts was not the daughter of Charles E. Roberts. And, Roderick Grant: we're in a discussion (at Taliesin Preservation) right now of how, in ways, the Hillside structure is better than the Taliesin structure. 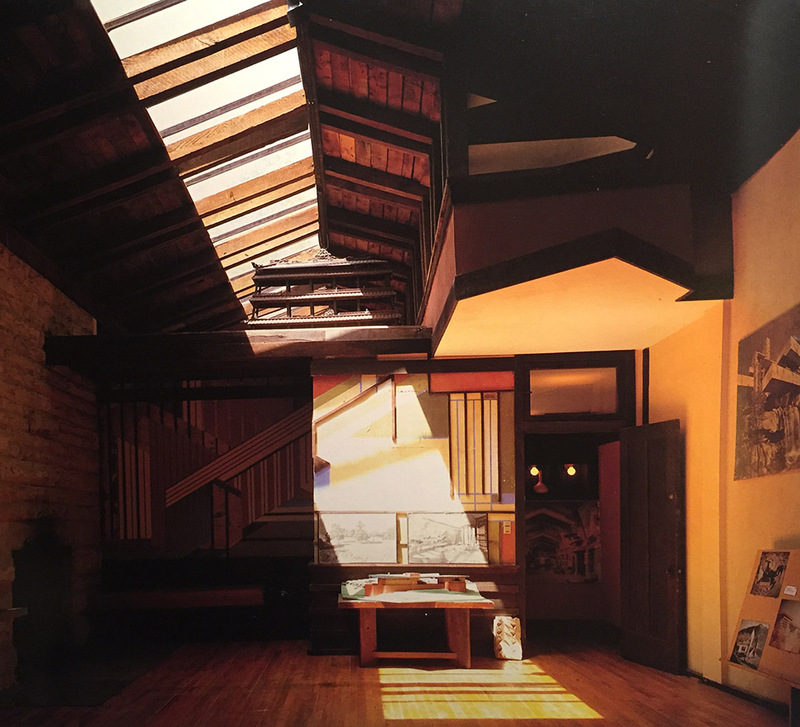 People want to see FLW's studio, but we're trying to emphasize that most photos you see of the older FLW, in Wisconsin, in the studio, were taken at Hillside. 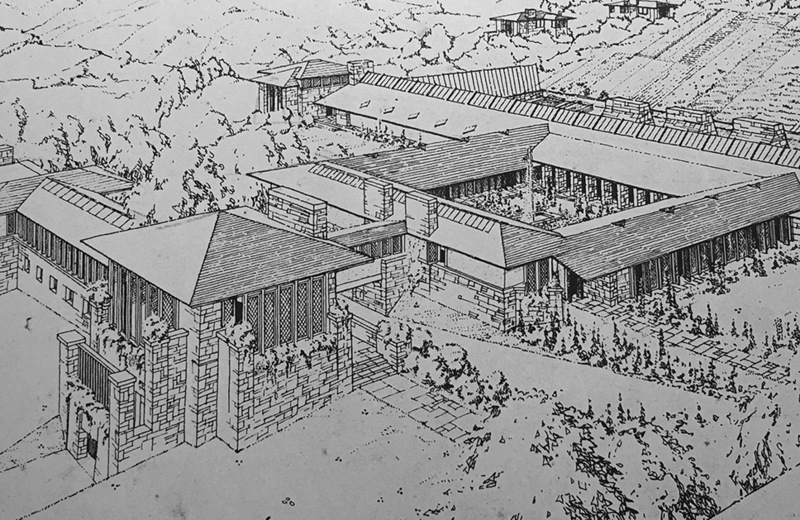 And that, if Taliesin were not on the estate, Hillside would be seen as the great building that it is. So far, we've not figured out how to draw people in on those positive points. The quest continues. Her Wikipedia article says she studied architecture formally ca. 1900. It also says she was one of the first employees in the Oak Park studio, which would put her there before these studies.